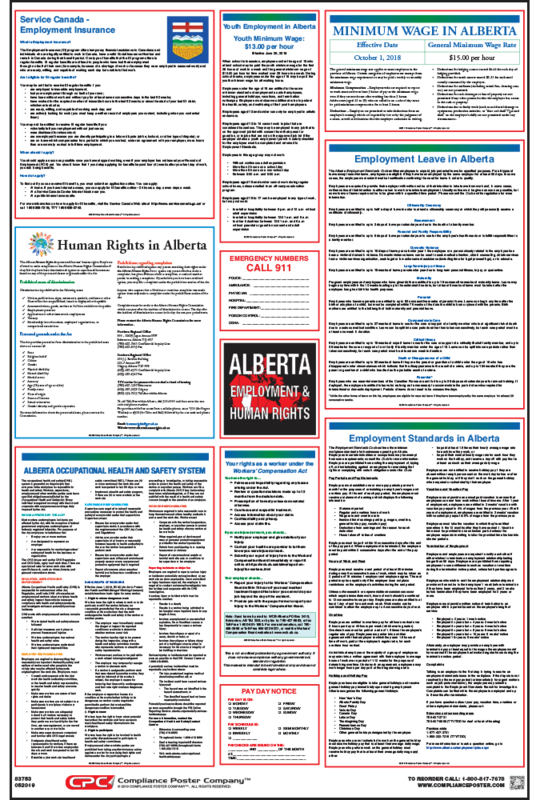 The Alberta Labour Law Poster notifies employees of provincial employment standards and health and safety information for Alberta, Canada. 27″ x 40″ – laminated both sides. Pick your industry to be in complete compliance with all state and federal labor laws for your state and industry. 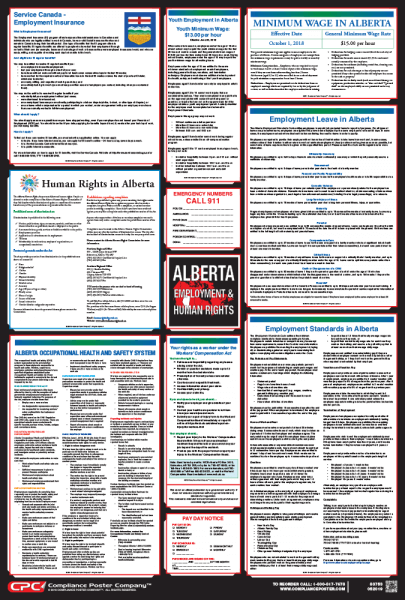 CPC’s unique All-On-One™ Alberta Labour Law Poster includes informational provincial labour law notices which inform employees of employment rights and responsibilities in the workplace. Minimum Wage in Alberta (September 2018) – Revised to maintain only the October 1, 2018 minimum wage. Alberta Occupational Health and Safety System (September 2018) – Revised to describe the revised provisions of the Occupational Health and Safety Act. Multiple sections of the companion poster have also been revised to describe current posting requirements. Human Rights in Alberta (January 2018) – Updated to state that age is a protected ground in goods, services, public accommodations, facilities, and tenancy. Your poster ships with a FREE Companion poster, conveniently sectioned to allow you to post current copies of laws, regulations, and employee notices as required by provincial law. © 1989 - 2019 Compliance Poster, Inc. All Rights Reserved. All-On-One Poster, Mobile Poster Pak and Peel 'N Post are trademarks of Compliance Poster Company.